Priyanka Chopra leaves no stone unturned when it comes to her sartorial choices. The fashion queen doesn't seem to have an ordinary fashion day and keeps giving us back-to-back stylish appearances. She had another round of Quantico season 3 promotions and she turned up every time looking like a Goddess. The way she slays with her fashion outings is a stuff that needs to be documented. She was recently seen wearing a pastel blue lingerie blazer dress from Dion Lee as she graced the Late Night with Seth Meyers in New York. While the fashion police was impressed with the attire, there were some people on social media who found her dress funny. 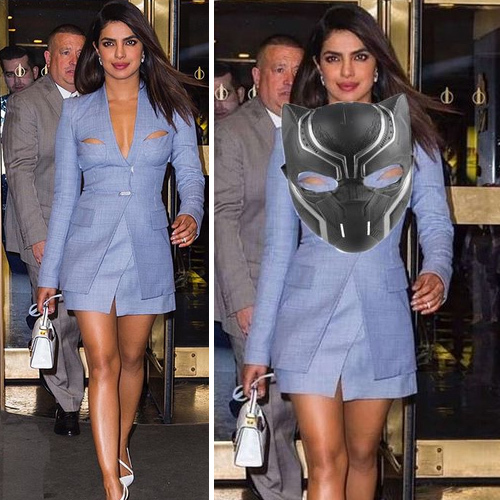 Thus, once again, PeeCee's outfit became the topic of discussion on Twitter with people coming up with some hilarious jokes on it.